Jewel Bryan, age 94, of Toledo, passed away Friday, November 23, 2018 at Heartland of Oregon. She was born March 11, 1924 to Jesse and Rosie (Jenkins) Brewer in Wayne County, TN. A talented seamstress, Jewel was employed by Hass Jordan as a seam assembler. She not only enjoyed sewing but also, quilting, knitting and crocheting. Jewel enjoyed tending to her flower garden and sitting on her front porch watching the neighborhood birds and squirrels. She was known by her family as a wonderful cook, especially during the holiday season. An animal lover, she adored and spoiled her dog, "Princess" and cat, "Sassy". Jewel will be remembered by her family as an awesome grandmother, who was generous, sweet and loving. 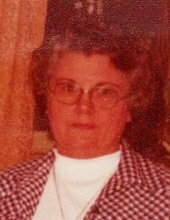 Jewel is survived by her granddaughters, Denise (Karl) Rable and Dawn (Jon) Heaton; great-grandchildren, Darla (Rob) Lark, Jeremy (Mary) Heaton and Mandi (Nate) Kelly; great-great grandchildren, Jeremiah Heaton, Cameron Kelly, Ethan Heaton, Caleb Heaton, Dylan Heaton, Draven Kelly, Drew Heaton, and Aubree Heaton; brother, William (Kathy) Brewer; and many nieces and nephews. She was preceded in death by her parents; husband, Grady; daughter and son-in-law, Mary Marie and Dennis Lee; great-great granddaughter, Liliann Heaton; and 8 siblings. Family and friends may visit Monday, November 26 from 4-8 pm at David R. Jasin-Hoening Funeral Home. The Funeral Service for Jewel will be Tuesday, November 27 at 10:30 am in the funeral home. Services will conclude with interment in Ottawa Hills Memorial Park. Memorial donations may be given to Hospice of Northwest Ohio or a charity of the donor's choice. To send flowers or a remembrance gift to the family of Jewel Bryan, please visit our Tribute Store. "Email Address" would like to share the life celebration of Jewel Bryan. Click on the "link" to go to share a favorite memory or leave a condolence message for the family.